Live shapes, design and style based on the principles of organic architecture. 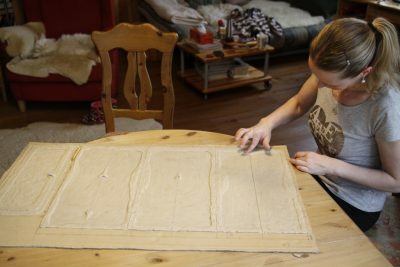 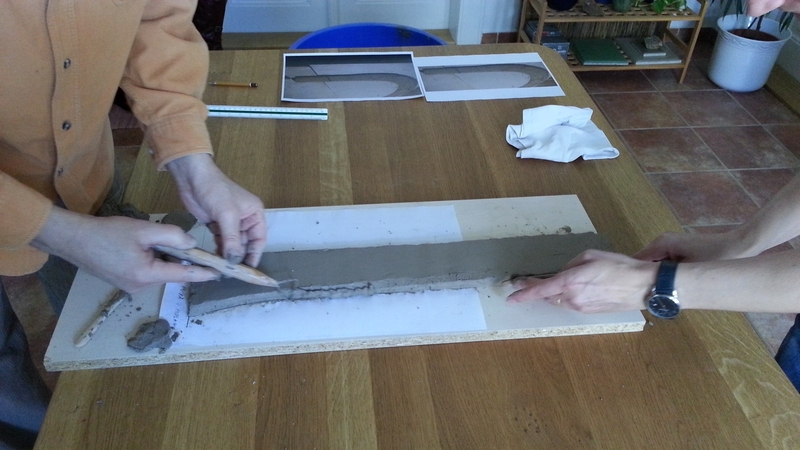 The entire project was prepared in close cooperation with family members. 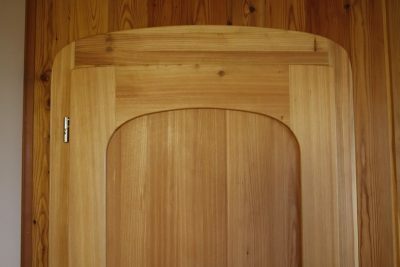 In order to better express their ideas about the shape of doors and furniture, I included joint modelling in the design. 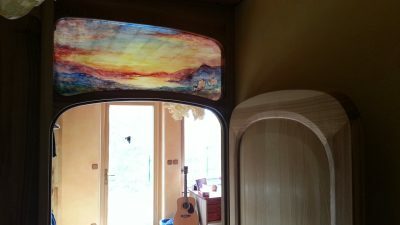 The married couple and their adult children who live there were included in the creative process. 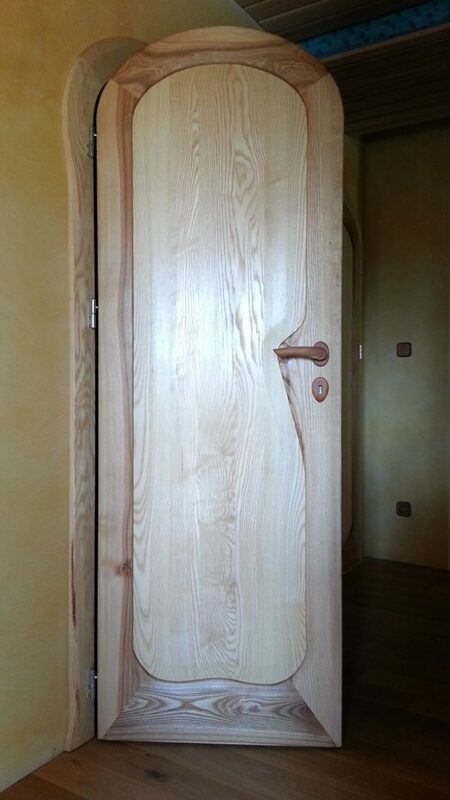 We designed the model of the closet sliding door and the model of the door between the rooms. 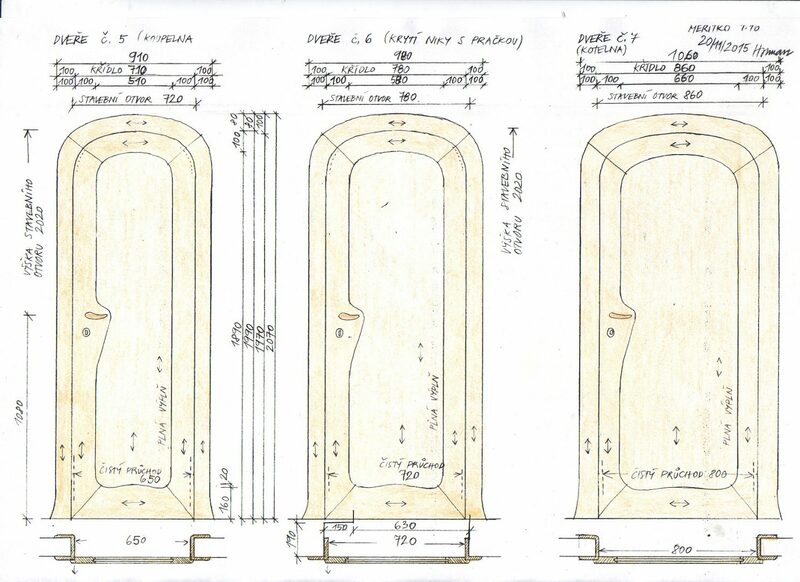 During the process of the design process, the family members decided to change the interiors toward organically shaped forms. 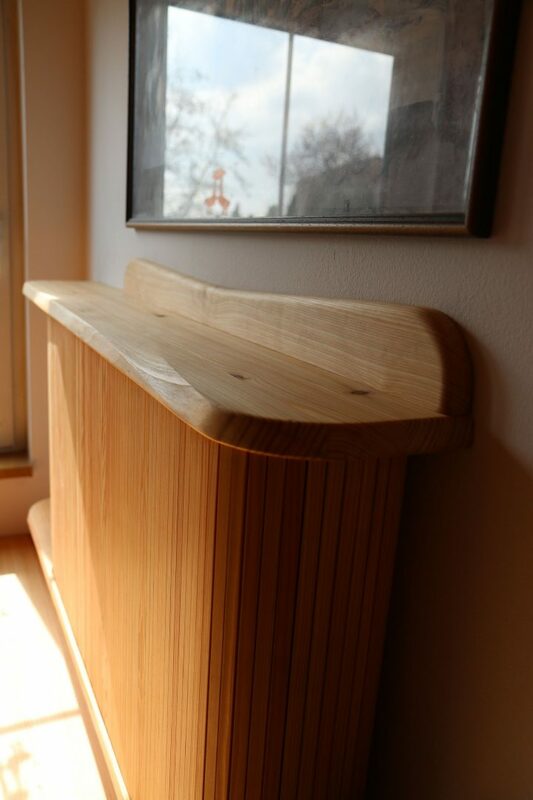 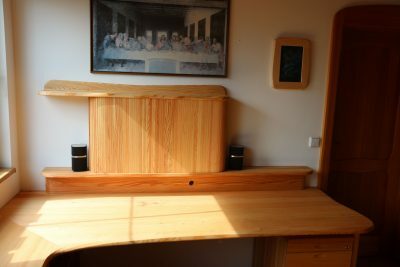 They wanted to use natural building materials and oil treated solid wood. 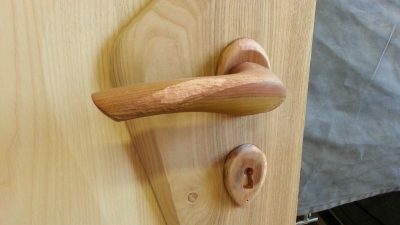 The details of the ash wood doors and handles of plum wood contain the so-called double-twisted surfaces. 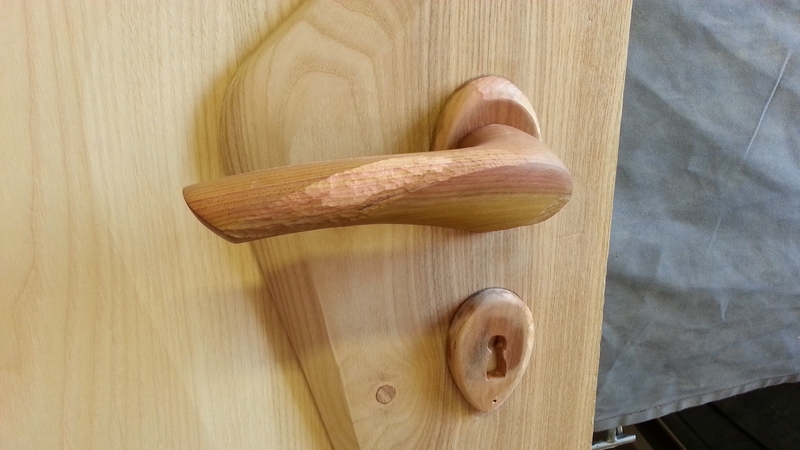 These twisted surfaces are seen at the edge of the door frame, below the handle and on the surface of the handle. The shape of the handle was designed along with Mr Marek Vodička and Mr Milan Černohorský. 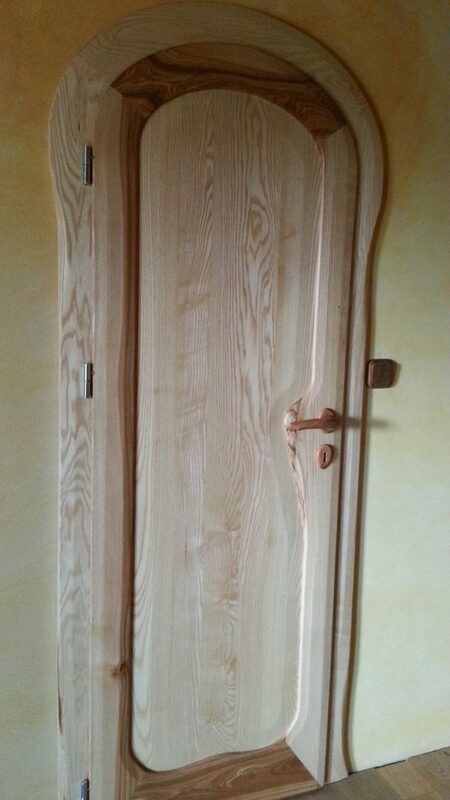 The door manufacturer was a carpentry workshop of Mr Müller. 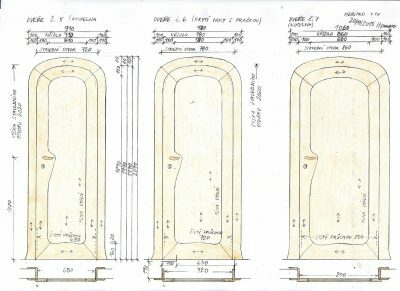 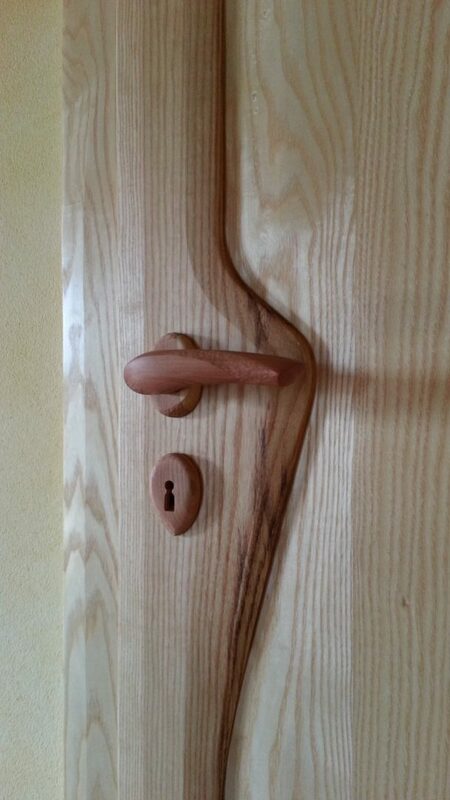 The manufacturer of the handles is Mr Marek Vodička. 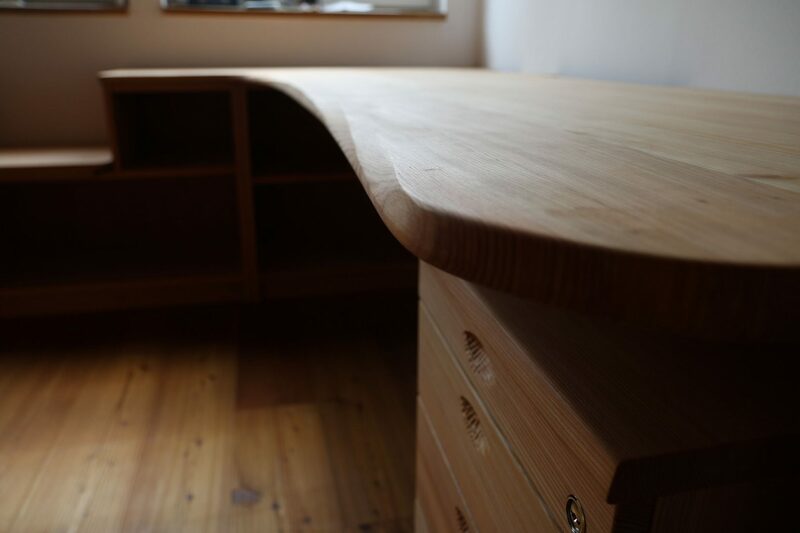 Double-twisted surfaces also appear on the edge design of the furniture. 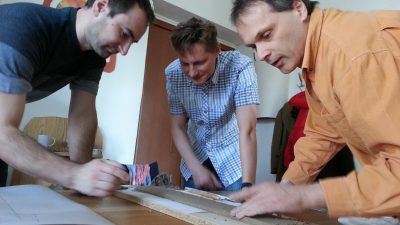 I worked with them where the user sees or touches them directly. These shapes stimulate the senses and have a therapeutic effect. 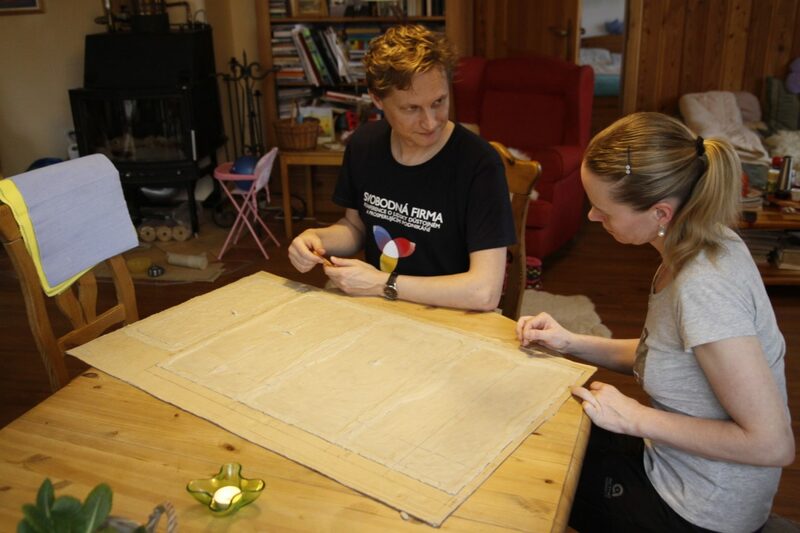 The basis of the therapeutic effects comes from the experience of the observer’s soul. The observer perceives dynamically changing shapes; in this case, the spirally twisting shapes of the furniture edges. 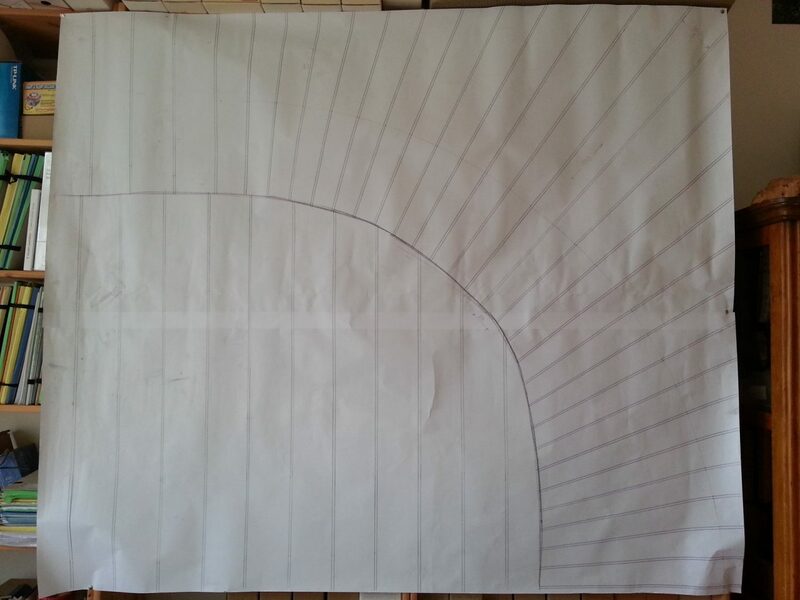 This dynamic transformation of the shape causes movement in the soul of the observer. 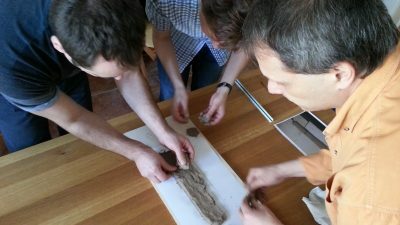 It makes him more interested in observing and touching it. These mental processes have a therapeutic effect on the entire living experience and lead to well-being of the entire human organism. 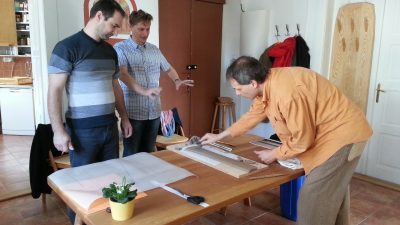 It’s about shaping our environment around us in a more lively and dynamic manner. It’s the way to organically designed architecture and design. 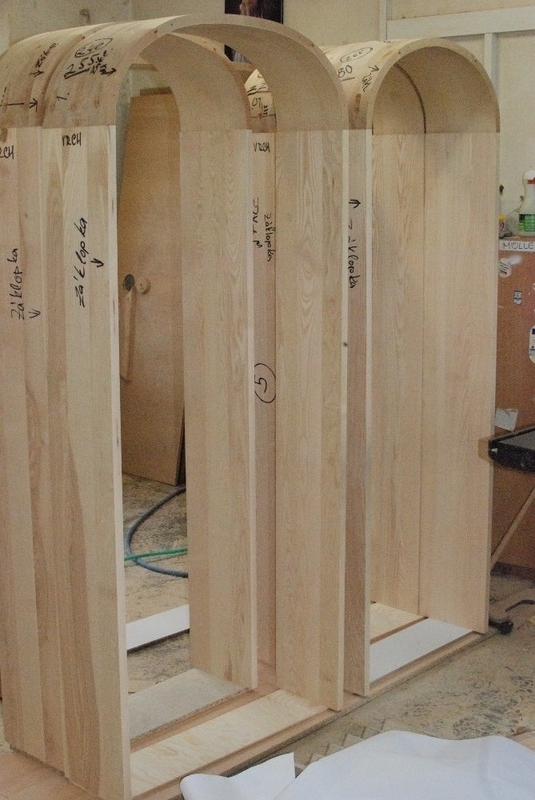 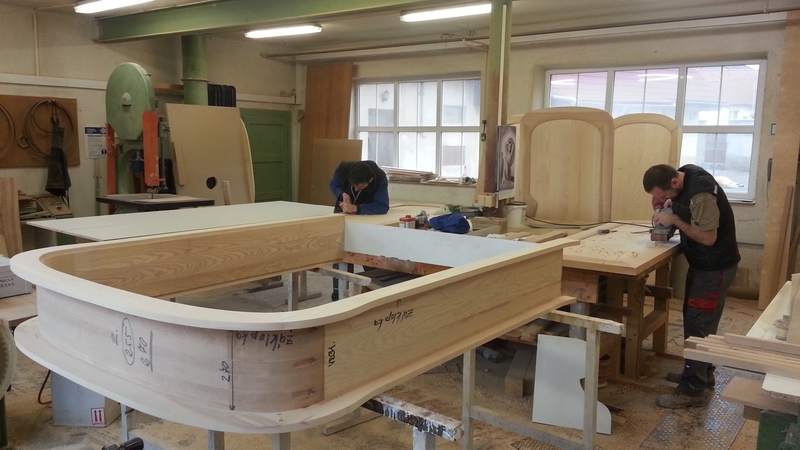 From the construction and workshop during the furniture production. 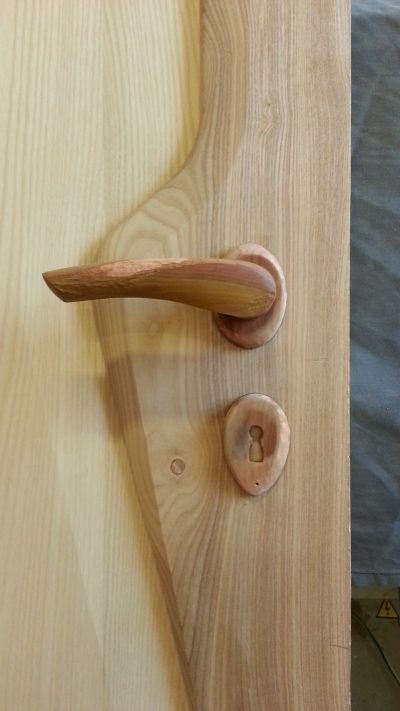 Detail of ashwood door and plum wood handle. Apartment door on the ground floor of the house. 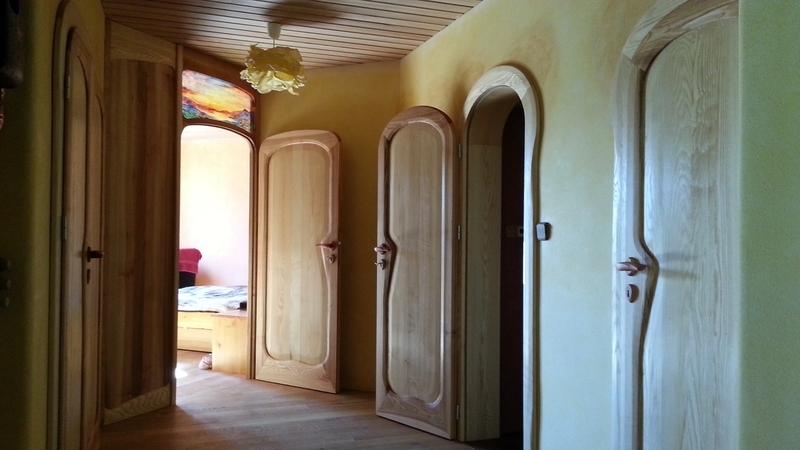 The interiors and doors in the apartment on the lowered ground floor are in a similar style. 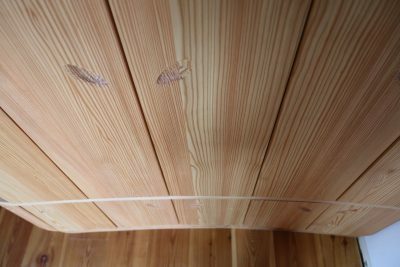 Design of edges of wooden ceiling soffits. 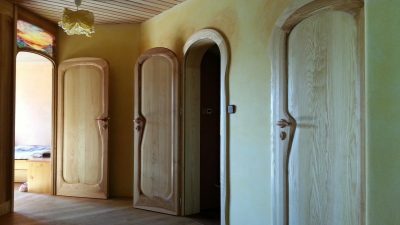 Model of doors of built-in cabinets and doors between the rooms on the lowered ground floor. 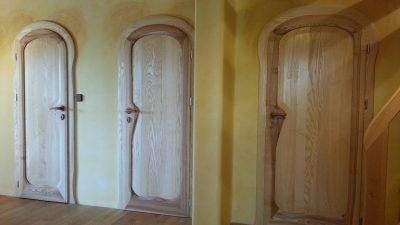 Joint modelling of basic shapes of doors. 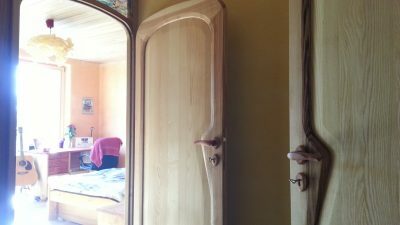 Modelling of the sliding door plastic model and the model of doors between rooms. 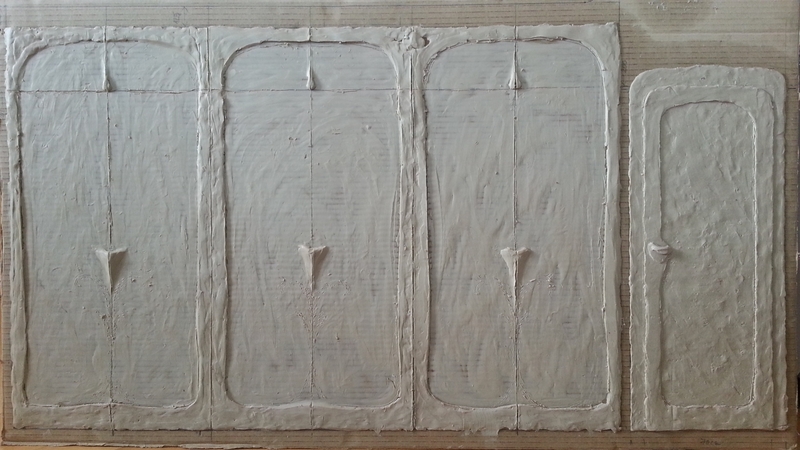 Detailed elaboration of shapes of the door fillings in the model. 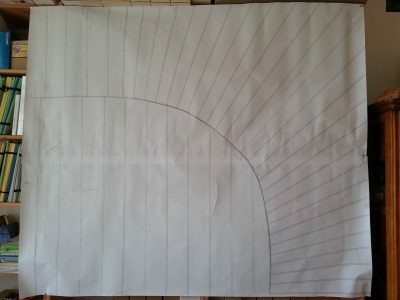 Joyful feeling from participating in a joint design also accompanied the implementation. 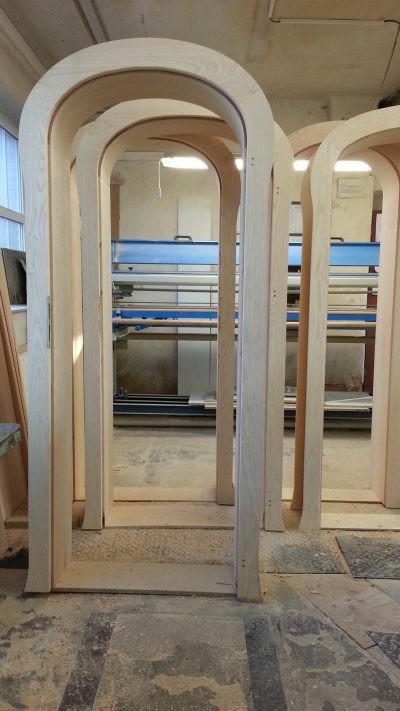 Interior door before their finishing in the joinery workshop. 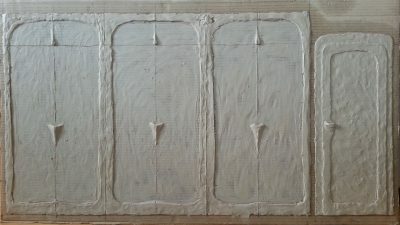 The shapes and details are based on the Goethenian artistic direction (http://www.olmuart.cz/aenigma-anthroposoficke-umeni--369/). 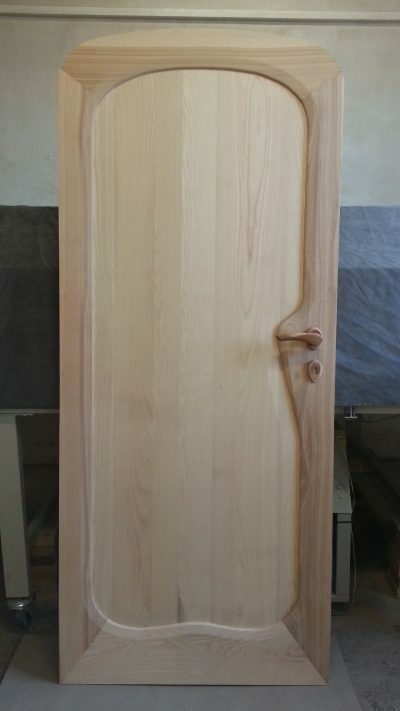 Interior door with wooden handle before finishing in a joinery workshop. 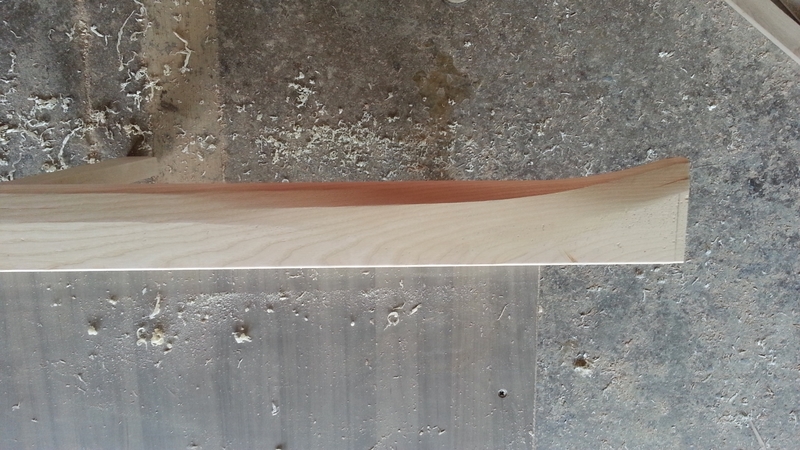 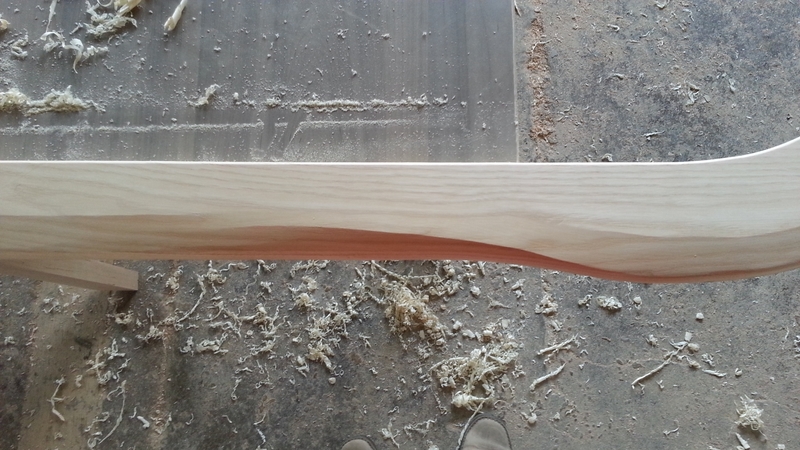 During the finishing of the detail in the joinery workshop we also focused on the shapes of the handle. 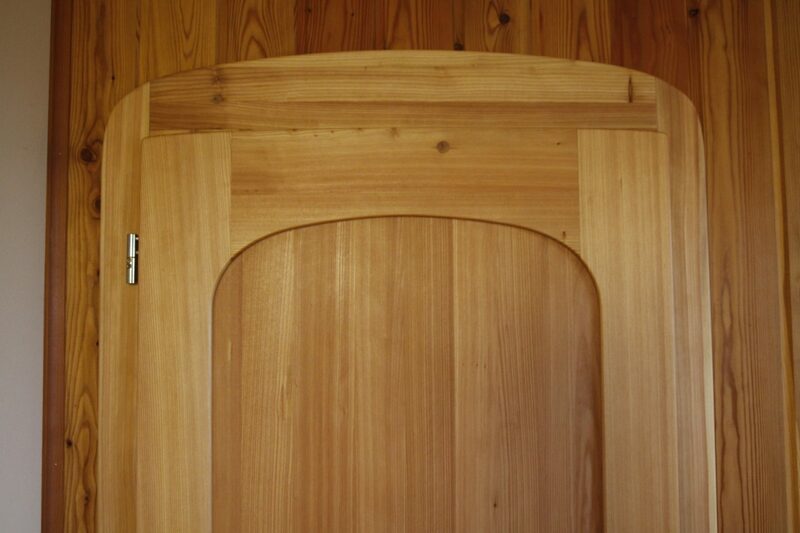 We gently shaped it according to the needs, so that its shapes are matched with the shapes used on the door edges. 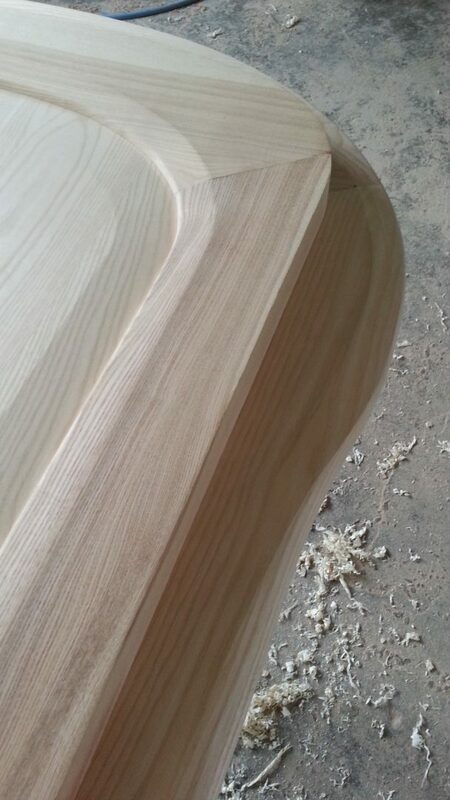 We used the so-called double-twisted surfaces in detailed shaping. 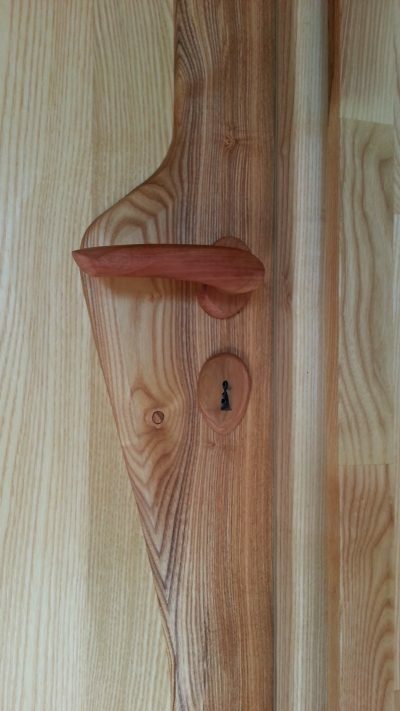 I designed this handle along with Mr. Marek Vodička and Mr. Milan Černohorský. Mr. Marek Vodička now manufactures these handles and also other shapes of wooden handles in his Mavlnka workshop. 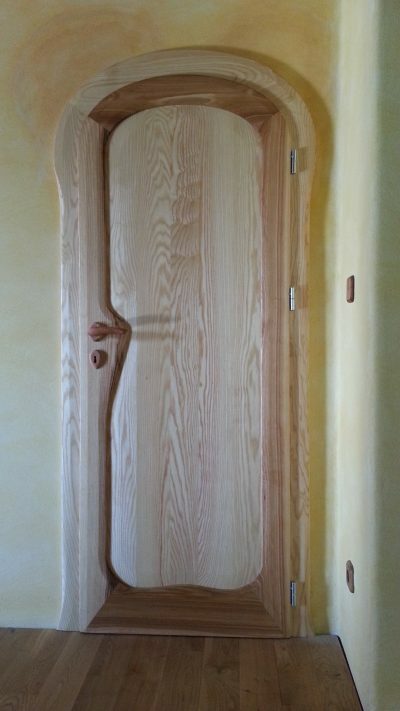 Interior doors with wooden handle of plum wood. 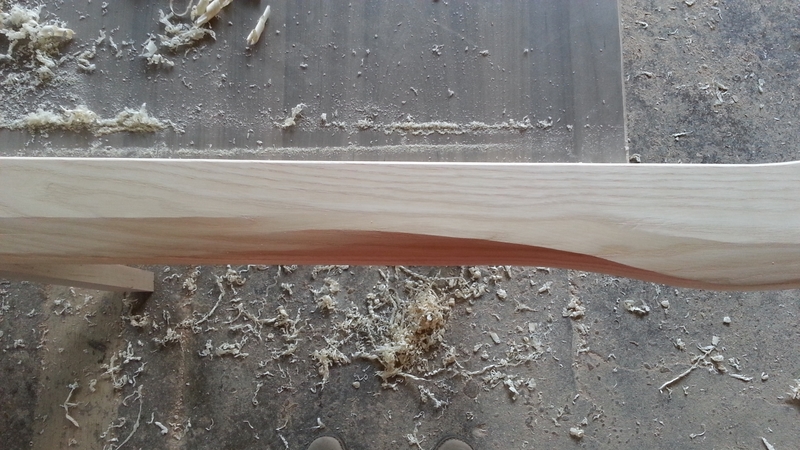 During the finishing of the detail in the joinery workshop we also focused on the shapes of the handle. 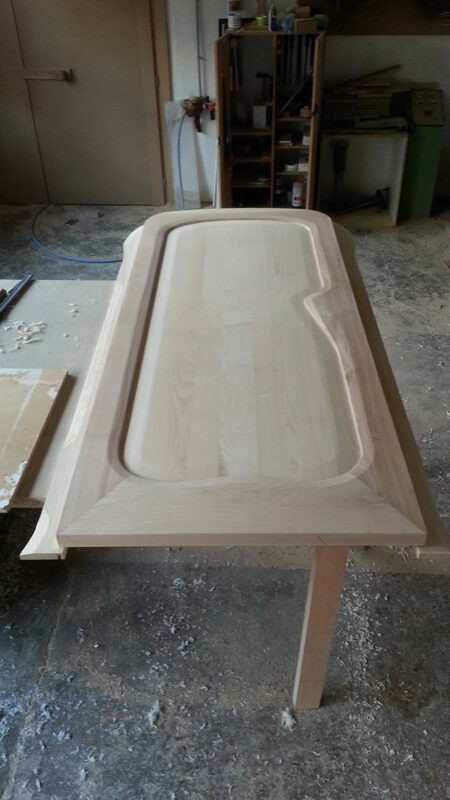 We gently shaped it according to the needs, so that its shapes are matched with the shapes used on the door edges. 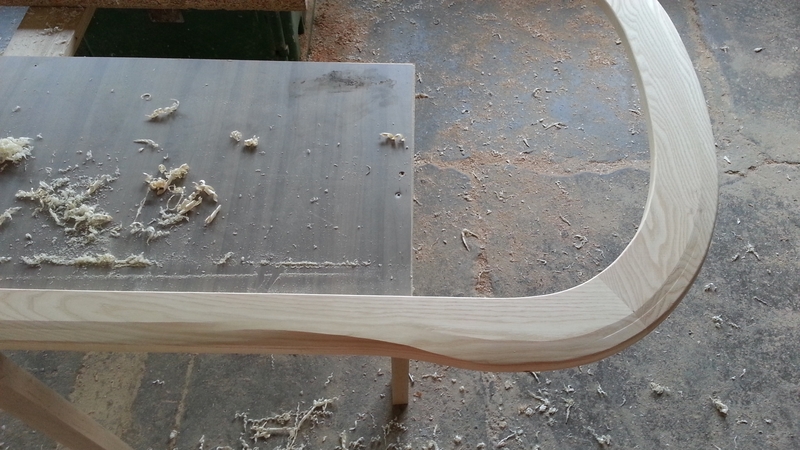 We used the so-called double-twisted surfaces in detailed shaping. 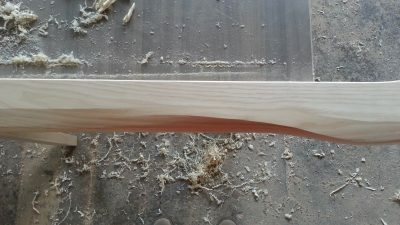 I designed this handle along with Mr. Marek Vodička and Mr. Milan Černohorský. 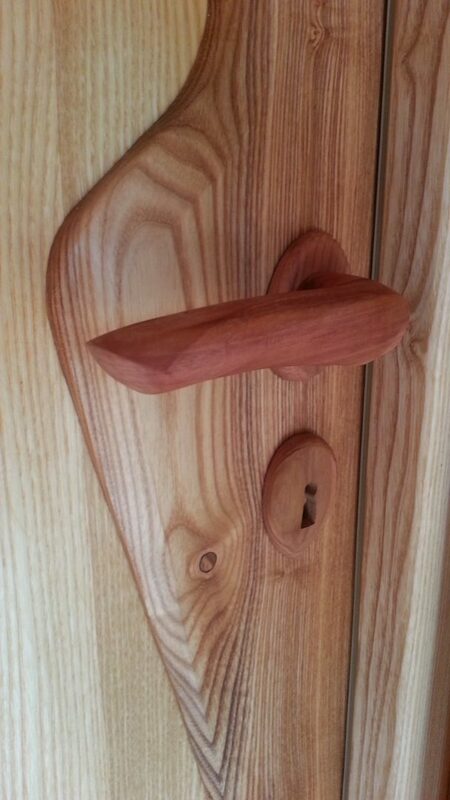 Mr. Marek Vodička now manufactures these handles and also other shapes of wooden handles in his Mavlnka workshop. 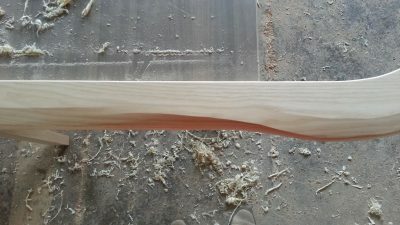 Door frame before finishing. The products are made of ash wood. 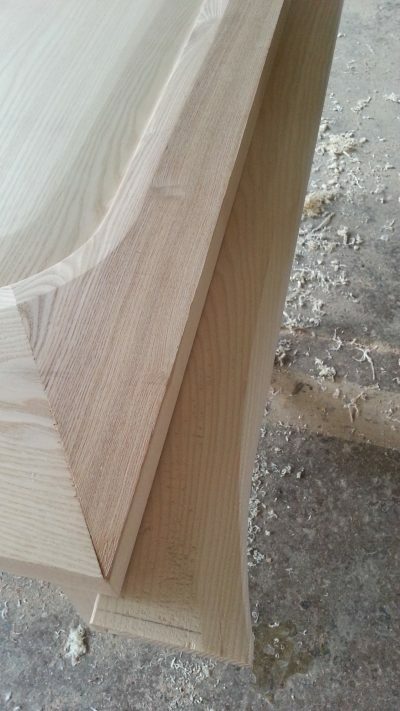 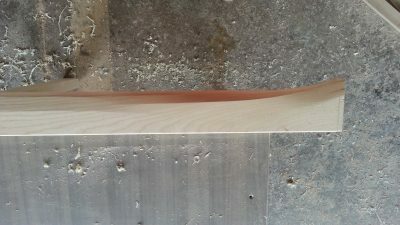 Detail of finishing of double-twisted surfaces at the edges of the interior door frame. Interior doors before finishing. 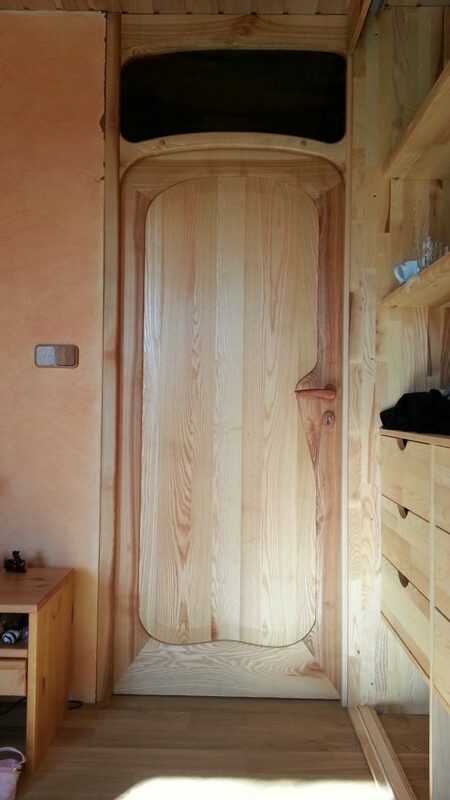 The door frame is made of solid ash wood. 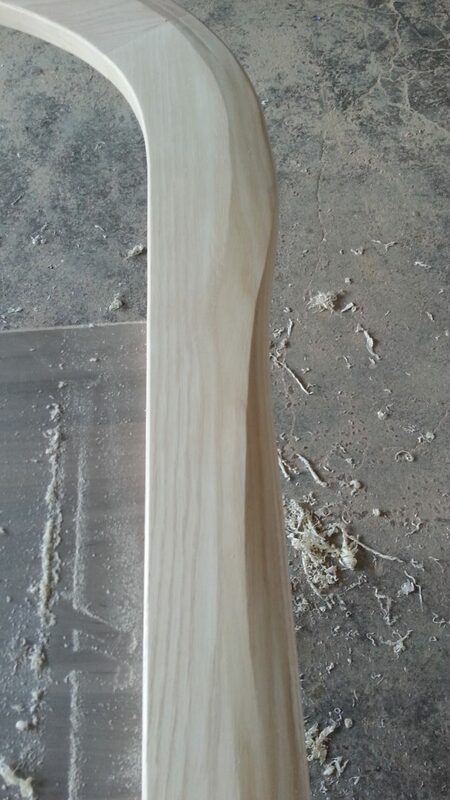 The filling is made of ash wood block board. 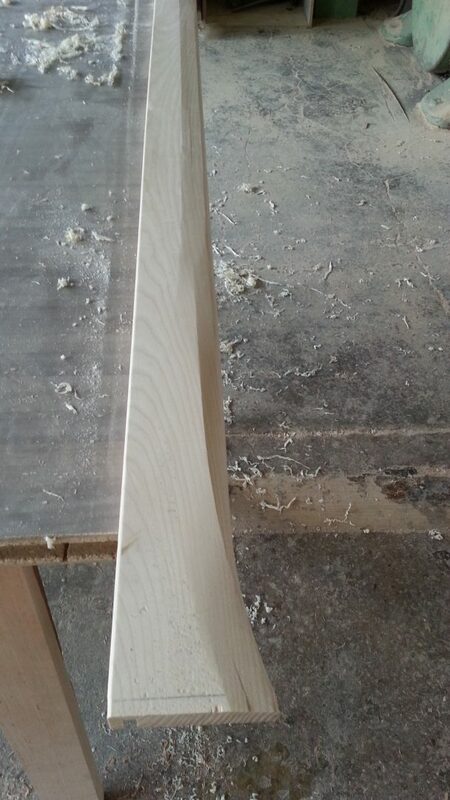 Both the filling and the frame are rounded and slightly chamfered at their joints. 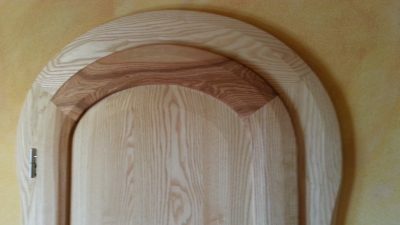 Elaboration of details in contact with the door leaf and the door frame. 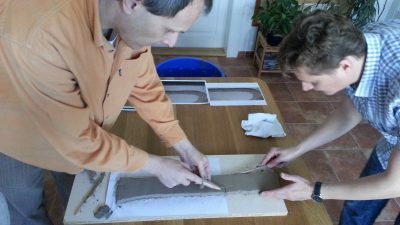 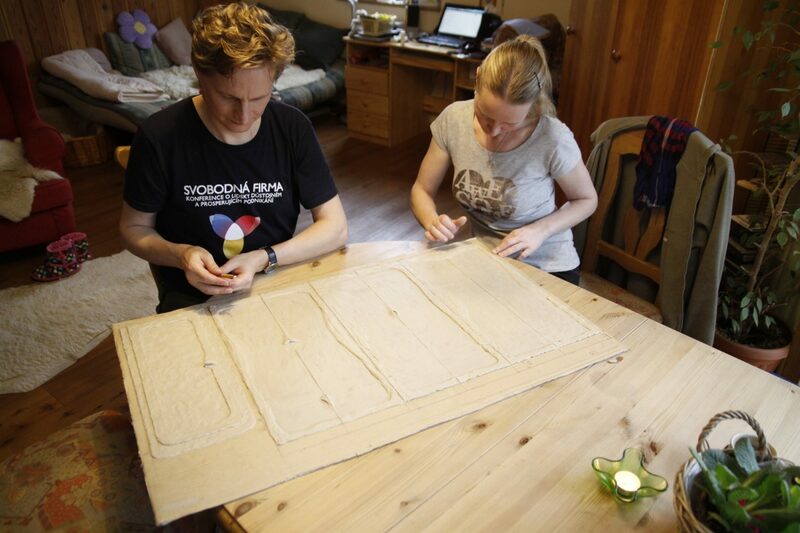 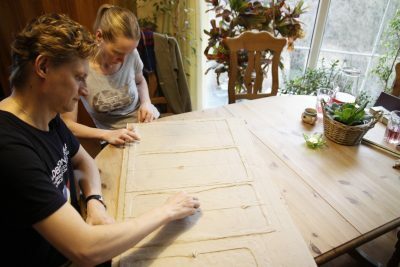 Together with the investor and the joiner we modelled the shapes of edges that will be on the door frame. 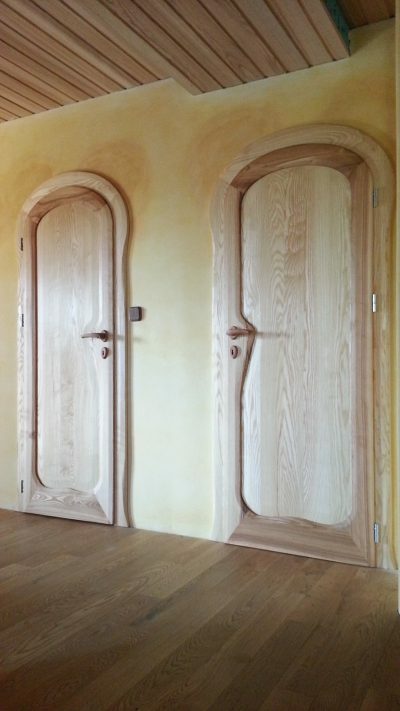 Both the joiner and the investor have tried and experienced creation of the shapes that will be used on the door. A so-called double-twisted surface is formed on the edge. 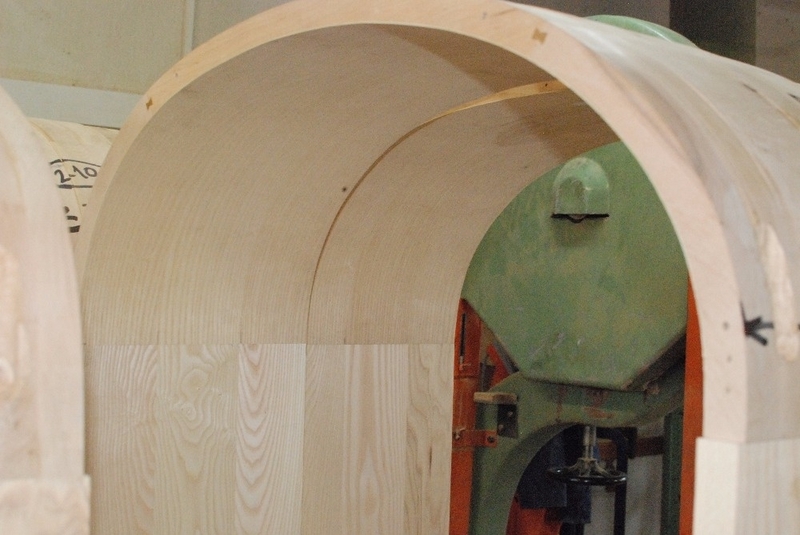 Its twisting, rounded character promotes the prominence of the extension of the bottom part of the door lining.